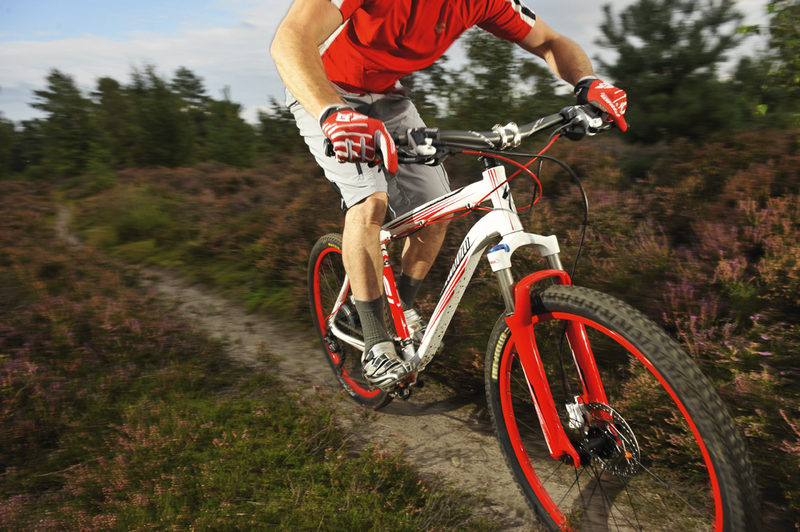 This is a review of the 2011 Specialized Rockhopper. For the 2013 version, click here. “It’s been nearly nine months since I tested the Rockhopper, but riding it again felt like a homecoming. I don’t put this down to some sort of photographic bike memory, but to the Spesh’s geometry — perfect for trail riding and more akin to the bikes we usually ride. Built around a fantastic M4 alloy frame, the Rockhopper has a slackish head angle and long wheelbase containing short chainstays and long front-centre: All this mumbo-jumbo means you feel really secure plummeting down the hill. Suntour’s fork does its job brilliantly too. While there’s only 80mm of travel there it actually works better than some forks with longer travel, and does a good job smoothing the trail. OK, there aren’t really any fork adjustments that actually do anything — turning the preload dial has next to no effect, while there is no rebound adjustment — but it’s perfectly dialled anyway. “Having not ridden a hardtail for ages, I was quite literally shocked at how rough the ride of the Rockhopper was, even on relatively tame trails. I also thought, my back is going to hurt tonight, and I was instantly reminded why suspension seat posts were so popular in the 90s. However, once I’d revised my riding style and blocked out the deafening chain slap the ride quality and geometry of the entry-level Rockhopper started to impress. In many way the angles and layout of the Rockhopper are more akin to a modern short travel full suspension bike (slackish, long and low), than a traditional hardtail with a steep head angle and ‘cat like agility’: even if the pedalling response and harshness of the Rockhopper are reminiscent of the old Specialized M2 race bike. Looking at the geometry of our two top scoring hardtails, it’s incredible that the bottom bracket height, chain stay length and down tube measurements of both bikes are within millimetres of each other…with the only obvious departures being head angle and front centre measurements. With a 1° slacker head angle, and the extra 20mm in the front centre that comes with it, the Rockhopper proved more stable, confident and fun to ride. 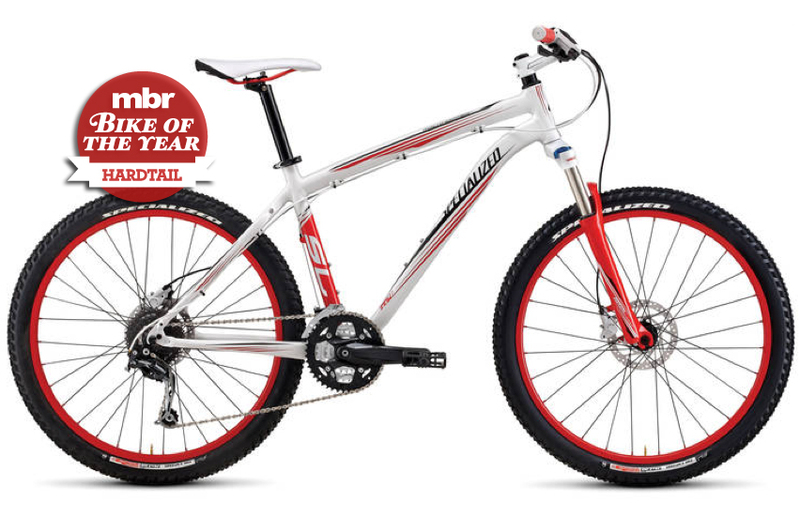 Granted, the KHS is lighter, but any difference in weight isn’t as noticeable as the performance gains of the Specialized Rockhopper’s improved handling, making it the clear choice for our 2011 Hardtail of the Year. If KHS is reading this, and thinking that all it needs to do is make the Alite 2000 slacker and ditch the Hayes brakes to get back on top…it’d be right.